Gabba gabba hey! 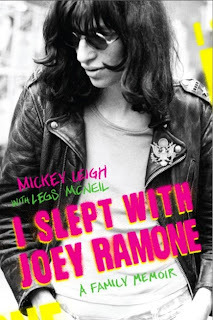 Attention all Chicago Ramones fans - Mickey Leigh (Joey Ramone's brother) and Legs McNeil, authors of the new book I Slept With Joey Ramone: A Family Memoir, will be in Chicago this Thursday, December 17 at 7:30 p.m. at Barbara's Bookstore (1218 South Halsted St.) for a signing, Q&A and discussion of the book. The two will also read their favorite excerpts from the book, which chronicle's Joey's story. Don't miss it! For more information on the book and its authors, click here.